Nearly 400,000 pedestrians pass through the Times Square Bowtie on a typical summer’s day. One of the developed world’s most frenetic culture cauldrons, it’s like a pinball machine on perpetual tilt. It’s only a five-minute walk from The Iridium Jazz Club at 51st & Broadway, even allowing for all the stutter-steps and red-light logjams. You can’t fight the Times Square effect as you approach the club; it’s on the soles of your shoes, it’s pinging in your ears, and it’s no ordinary load-in or soundcheck for a performer. Tom Bailey’s keyboard player strolled down Broadway 90 minutes before the show, her phone recording either for posterity or social media. Well, wouldn’t you? Nearing halftime on a 60-date North American summer tour – 50 of ‘em in support of Culture Club, the remainder modest headlining gigs in towns both great and small – the Bailey camp struck a strategic jackpot, with a two-night booking on July 31st and August 1st destined to rank among the most memorable for all concerned. The Iridium’s geared for maximum sensory impact and draws upon multiple historical notions of cultured intimacy: from artifacts and murals ringing the tiny club – capacity, 180 – to the brick-walled stage backdrop, this is a purpose-driven venue; that purpose includes a pre-show dinner taken at your table, invoking halcyon images of supper-club bookings for jazz, pop vocal and blues acts; the FM radio-grade acoustics and nearly faultless sightlines have sired numerous live recordings, some issued on the club’s IridiumLive imprint. To the touring musician, a show at The Iridium must feel like a depth charge in a pot of rice. 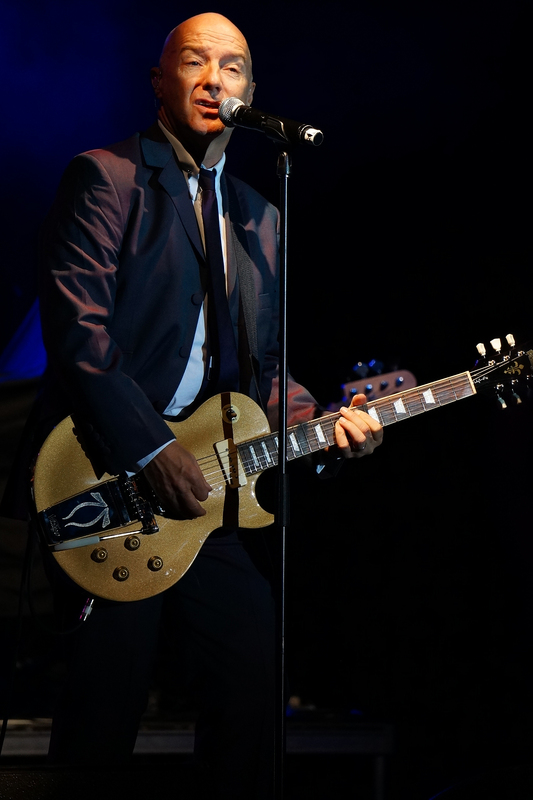 And so, on the last night in July, Tom Bailey strode to the front of the stage dressed head-to-toe in Johnny Cash black, collar popped, a black-and-white eye-charm lapel pin the lone concession to contrast. If shades weren’t already an accoutrement, I’d’ve suggested them. If you’d been following InstaFaceTwit for the past month you’d’ve known this tour’s dress code was Bailey By Wimbledon – all-white, the better to beat the heat. But as his black-clad band took point in swirls of dry ice, one thing came clear – I’ll bet he’d circled this show on his calendar. Well, wouldn’t you? For eighty minutes, Bailey and band – generally known to the fanbase as the Sisters of Mercy – shimmied and soared over the well-trod (classics from the 1982-1987 period) and the freshly minted alike (Science Fiction’s the new album and raison d’tour, and it’s excellent). Thompson Twins’ chartbusting successes might suggest the songs would always play better in large halls before swaying masses, but aesthetic perfection was at hand in this basement throwback. With elbow-grazing confines and pristine sound dismissing any notions of remoteness, every salvo found its target. Thus enlivened, the crowd sang back at the band, filling the club with happily sloppy ambience: You Take Me Up’s scale-climbing chorus bounced off the walls like a hootenanny; Lay Your Hands On Me, the familiar version of which was reworked by Nile Rodgers in this very city in 1985, surged with a fervour recalling the East Harlem Hobo Choir’s contribution to the Here’s To Future Days chestnut. And through it all, a happy crowd. People swayed in their seats and raised phones for choruses. Peals of excitement greeted every old song. These days, the live arrangements hew pretty closely to what a few of us used to call the “ten-inch versions,” many of which first appeared on 1988’s Best Of Thompson Twins: Greatest Mixes. These fell somewhere between the album/single/video definitives and their 12” extended cousins, with run times similar to what Twins played in concert. People misfile memories as the years pass, so every Bailey audience has a sizeable portion needing a quarter-minute or so to identify what its hearing. This rolling wave of recognition keeps the crowd’s attention, though, and an elongated romp through Lies’ or Love On Your Side’s dramatic digressions is always a good thing when the mood is high. I thought about the unmissable feminine element in Thompson Twins records and how Bailey’s chosen to present it. For most of his pop career, Bailey sang words written by a woman. No shrinking violet, Alannah Currie could be trenchant, but in beckoning Tom to her side of the philosophical divide the output was dialectically sound. Meantime, his song arrangements pulled rather than pushed – basslines bounding not thudding, melodies enriched by capricious fills not clenched repetition, choruses wrapped in bright harmony voicings – producing music with slinkier contouring than most superficially similar new wave chart pop. Since his return to the live arena four years ago, Bailey’s band’s been exclusively female, and it’s no sop to progressive politics. First of all, Currie was an essential component to the vocal blend. Second, this is not a sprawling touring company with parts shared amongst eight or 10 performers. Third, the music’s deftness benefits from a soft touch, and each of Bailey and the Sisters are classically trained. Decades removed from the Thompsons’ scruffy beginnings, Tom Bailey chooses order over chaos. The band, London-based professionals awash in their own gigs and projects, evinces youthful positivity and light. Paulina Szczepaniak, a drummer who’s also played synths on select Bailey dates, is a blur, sticks tumbling across her kit like Bamm-Bamm Rubble on Christmas morning. She grounds the songs with a heavy kick. Alice Offley, a keyboardist-bassist double-threat, glides across the stage to engage Tom in brief axe duels; his foil, an interactive element he didn’t have on earlier tours. Charlotte Raven, a keyboardist with (as yet, untapped) multi-instrumentalist possibilities, moves like she’s playing a Wii Motion Plus. She’s a better barometer of rhythm than a Motown percussion track. All three sing, and whether in the call-and-response style of Twins 45s or a wider harmony stack, the vocals are bright and true. Tom wanders the stage all night long. Electric, acoustic, Novation synth, harmonica, a couple nods to Alannah’s colourful percussion fills: he does it all. Daring to stand under Les Paul. Borrowing a moment on Alice’s Novation whilst she’s downstage. A guitar solo played back by the drumkit. Handshakes and handslaps with the front row. A charming awareness of interactive crowd opportunities (singing “we’re two of a kind, yes we are, yes we are” whilst pointing out two sets of twins in the crowd). A nod to the club’s table arrangements (beginning Doctor! Doctor! with a cheeky “I saw you there…just sitting there…”). And through it all, a happy performer. Tom is admirably fit and frisky: there’s no high note of yore he won’t chase, there’s no slackness in his gait, there’s no synth solo he won’t add a flourish to (he can’t curb the playful tinkering, and I think it’s great). The music is fresh for its age, having largely avoided the bruises of decades-long touring or T.V. advert abuse. In sum, the parts are impressive (the Sisters, the leader, the songs). The whole (how’d it make you feel, audience? how’d the audience make you feel, Tom?) is even greater. Lucky me, I’ve caught four shows on this tour. Before the New York pair, there were southern shows back around Independence Day. In Florida, opening for Culture Club at the House Of Blues just outside Orlando (July 3), Tom sounded hoarse. He’d lost a battle with the air conditioning on the flight over. The sustain on the high notes just wasn’t there (Doctor! was particulaaaaarly taaaaaaxing). The Sisters – with the redoubtable Amanda Kramer in Charlotte’s spot for the first four gigs – covered admirably. Maybe this was the genesis for further developing the backing vocals, I dunno. A candid Tom announced his dilemma off the hop and then played a strong enough set the pro-Culture Club crowd gushed noisy approval anyway. And Hold Me Now left ‘em beatific. 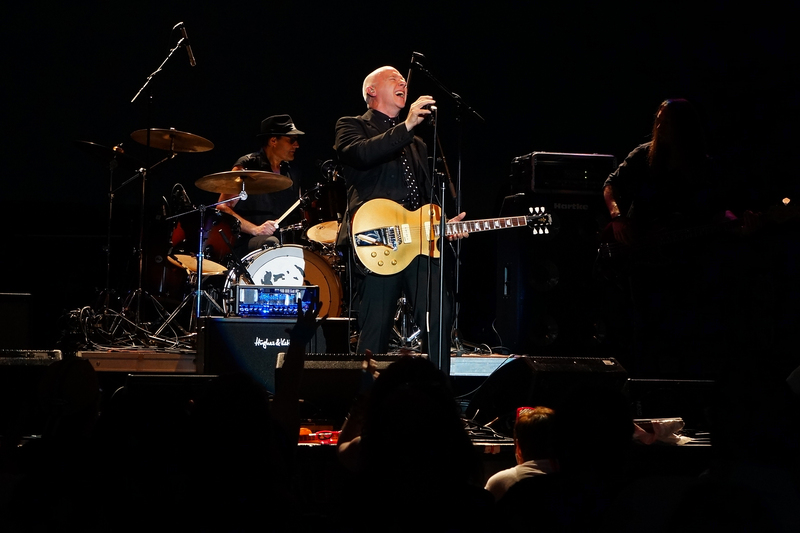 In Mississippi, Tom played his first full-length, headlining show in 31 years at the IP Casino in Biloxi (July 5). The seats were presumably filled with comped gamblers and vacationers. But the floor was filled with legit Twins diehards. They came from Florida, Georgia, Illinois, Canada. They wore matching fan club reunion t-shirts. They gathered beforehand to share old tales of fandom and bask in the giddy expectation of the imminent Science Fiction album. With no hammer over their heads, Bailey & Co. stretched out for a 14-song program of crowd-pleasers, some less-familiar treatments of his personal Twins favourites, and world premieres of two key Science Fiction tracks. Recovered from his near-death experience with that rogue A/C, Bailey sailed through those personal faves – the ballad version of King For A Day and the 2014 rewrite of If You Were Here – with ease, but a thoughtful, slowed-down Runaway might’ve stolen the show. Branching out with a lengthy mid-song solo at his Novation, he cracked a window into the song’s genesis, one of familial regrets and disappointments. The Fiction premieres joined the single What Kind Of World (already essayed on the UK festival circuit) in adding a genuine extradimensional currency. 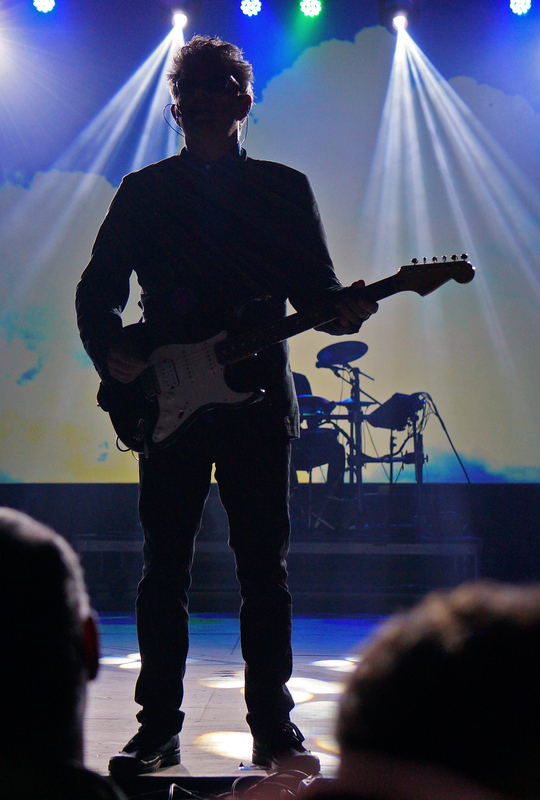 Out on that floor in Biloxi, absorbing a pair of heretofore-unknowns was a tall order for the fans. But hey, this is why people travel: precious, unrepeatable experiences. Shooting Star attained lift-off with changes Coldplay would die for, the punchy chorus hey-heys and rippling piano work making the strongest impressions. Science Fiction, in an arrangement I’d later come to recognize as from the bonus disc of Fiction remixes, sounded even more promising, with a cotton-candy chorus and a wondrous middle-eight. Evidently taken with its potential, Tom held it back for the encore. And Hold Me Now left the crowd on a cloud. Back in the centre of the universe, Tom Bailey had a second Iridium show to play. First one went down so well the team hired the in-house camera guy to film the finale. Still in rock-star black, but in a colourfully psychedelic collared shirt to mark the difference. Details matter. 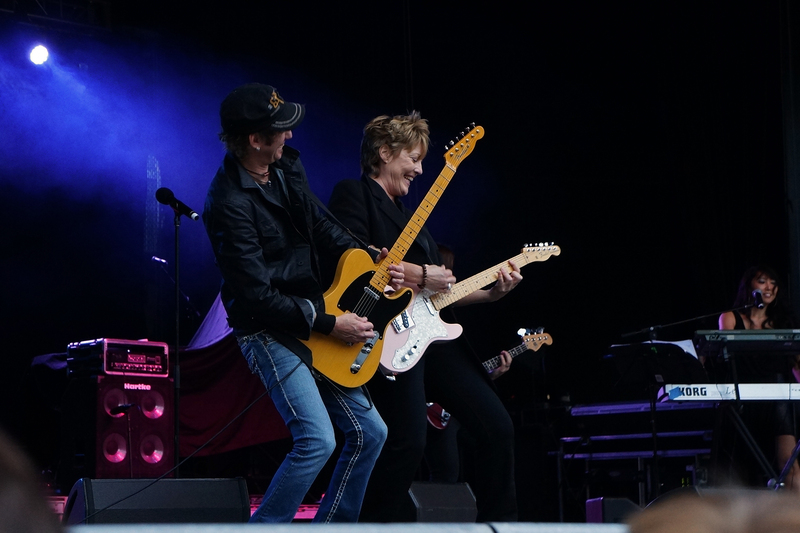 The ballad-speed King For A Day replaced the churning, clarion-like In The Name Of Love as an intimate opener. Bold move! What Kind Of World, by now a fully appointed member of the family, didn’t sound even a speck outta place between the clattering Love On Your Side and a typically rousing You Take Me Up. Runaway reappeared mid-set after missing several shows. Lay Your Hands On Me – once dismissed by its author as a Hold Me Now clone (and perhaps he was fixating on the Alex Sadkin-recorded original at the time) – reaffirmed its bona fides as a glittering collision of tender sentiment and hands-in-the-air testifyin’; I hope it never leaves the set. Paulina, Alice and Charlotte transformed Science Fiction into a bustling groover, locked down with choppy synth chords and rumbling bass over a stiff-backed beat; it’s gratifying to see new things happening to still-new songs. ‘Twas Hold Me Now. To paraphrase New York critic Robert Christgau, it’s a record that’s repaid repeated listenings in the daily life of someone with 5,000 other records (or whatever I’m up to, it’s close) to get to. Any room Tom Bailey plays for the rest of his performing life knows it’s coming, how it’ll begin, and – thanks to a crowd contribution first glimpsed in Philadelphia back in 2014 – how it’s going to end. There will be that heaven-sent piano figure and a scream of genuine delight from the crowd at the start. There will be early chorus attempts from scattered audience members while the band builds to the vocal. The crowd’ll absorb the coolly impassioned verses and the gorgeously simple refrain, the fluttering piano spotlight and the spartan breakdown. The Muhammad Ali of end runs – the “you ask if I love you” verse as butterfly, the cycling call-and-response chorus as bee – will seemingly stop all time. I’ve seen it. If you’re reading this, you’ve probably seen it: the most genuinely smiley finale this side of a Brian Wilson concert encore. Drawing the blueprint in 2014, the last ticks of Hold Me Now were initially intended as a modest set of downstrokes on Tom’s Fender. No longer. The crowd takes the cue, takes over. Tools down and IEMs out, Charlotte and Alice gather downstage while Paulina extricates herself from her kit. Sometimes she brings her sticks, maybe in case the throng needs a tempo check. They don’t. They’re singing to the beat of their hearts. Tom Bailey’s first vocal pop album since 1996’s Ether brings this writer out of blogging semi-retirement. Evidently an inveterate escape artist, Tom Bailey‘s habitually painted himself into corners as a means of aesthetic expression. From binning the safety-in-guitars first iteration of Thompson Twins and recording the resultant hit-bound album on a single synthesizer, to trading out the tattered-but-still-marketable Twins banner for an obscure new name while making his best record in a decade, to a post-millennial drift through largely voxless crypto-ambient dub and world music of increasingly vivid melodicism, his restive cycles have become canon. Tom’s car is always revving in the drive, and he’s always tracking different colours on the map. That Bailey’s parked back on planet pop is fan manna, and his new vehicle – a tour-plus-album model – is a resounding gift to one of pop’s great forsaken fan bases. 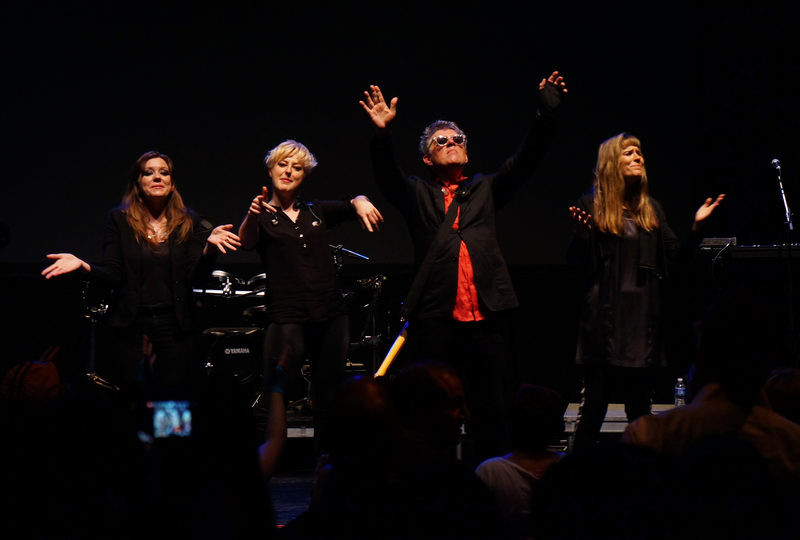 Thompson Twins fans never resigned, they just lost a cause to rally around, creating a fascinating socio- and musicological profile of people with formidable knowledge of the work and the environment in which it thrived, but scant interest in either the work’s spiritual descendants or today’s simpatico alternative/indie music community. Without the artiste’s involvement in upholding, promoting or refining the brand, the band’s possibly had fewer champions than any major act I can think of from the past quarter century. Or put it this way: Thompson Twins fans descended upon Bailey’s 2014’s pop tour like a pack of Unbreakable Kimmy Schmidts. This goes a way towards explaining why Tom Bailey concert crowds are so cozily convivial. I’ve seen shows in a half-dozen different towns the past four years and the vibe’s always like a high school reunion, only without the tension. Oh, and if the Bailey Unbreakables are looking for a new cause to rally around, it leaps off the grooves of Science Fiction, a charming and inventive “adult alternative” album (I think that’s what they call them) that’s also among the best synthpop records in ages. Whether by necessity or bloodymindedness, Science Fiction was evidently stitched together by humble means – a laptop, some plug-ins, a place to sit – which contributes mightily to the tight weave informing each of its 10 tracks. With Bailey playing every note and singing most of them too, Fiction approaches the kind of performance unity once reserved for early Prince albums or Pete Townshend Who demos. There’s a propriety in the performances that borders on the academic (no Steve Stevens guitar rampages, in other words), while also revealing the build quality to be first-rate: the transitions are just fantastic, with beautifully organic, song-serving sequences pitched way above the I.Q. of current chart pop, which often seems frenzied and pushy. Indeed, Fiction glides in like it’s already cased the joint and knows where all the goodies are buried. And the goodies! Classic Thompson Twins records were deep on details, and Fiction‘s more of the same. Bailey thinks like an orchestra percussionist regardless of the instrument he’s playing – watch his hands in concert- with no hard stabs of sound; instead, he offers angular dabs of rhythmic texture (the chatty synths in What Kind Of World, the aqueous bass taps in If You Need Someone, the slack guitar grounding Bring Back Yesterday’s verses) which creates bursts of momentum without disturbing the volume. There’s a lot of movement within the arrangements, too, as he seldom lets a new verse or chorus go by without fillips: on the hypnotic Feels Like Love To Me, Science Fiction’s prettiest song, quiet dub patterns turn choppy, a promising flourish of guitar chords appears but once, the marathon outro toys with all sorts of open vowel sounds (“WHOAA-ooh-whooaah, whooah-oh-aaah” is my favourite – and no, I’m not kidding). Layered momentum helped Thompsons singles really work as dance remixes: even his melodies have a heartbeat. The vocals also experiment with cadence and texture. Again, Feels Like Love To Me shines: a two-bar rest between the verses’ first couplet disappears in the second pair, while an unpaired fifth line tumbles out just before the chorus. Ship Of Fools works a similar temporal feint with mere two-line verses. Lead single What Kind Of World deploys a Spanish-language hook as a recurring rhythmic motif. (In a passage of meta Bailey bliss, the Spanish hook locks into a brief stepwise dance with the chatty synth from the intro, but Tom plays alternate notes as he’ll often do in concert solos. The effect is mesmerizing). The beguiled hopeful in Shooting Star sings in a softened, higher pitch that even briefly resembles Chris Martin; the vexed lover in Blue sounds twice as old, as Bailey reveals a heretofore unheard huskiness at the bottom of his range. Coupled with the descending piano line, Blue recalls a Bowiesque brand of glam. And the “whoa” is to Tom Bailey as “yeah” is to Paul Buchanan or “hee” is to Michael Jackson. They appear everywhere, and they are welcome to stay awhile. Science Fiction’s loaded with upper-echelon Bailey songs, and each has something memorable: the glorious chord switcheroo under Science Fiction’s middle-eight (“I’d like to make you mine, but you’re travelling in time…science fiction” – is that my favourite passage on the record? ); the massive klaxon-like guitar swell in What Kind Of World’s later breaks (is this an AmpliTube plug-in, Tom? ); Shooting Star’s grinding, upward momentum after the last round of choruses; the sunny ring modulation effect on Feels Like Love To Me’s backing vocals; Blue’s resigned “sleep all day, lie awake all night” reality check (my favourite couplet); Ship Of Fools’ nods to Storm On The Sea’s sway and Alannah Currie’s percussion fills. There’s so much to dig in these tracks, and the work is all play. If You Need Someone merits special attention, as a delightfully unexpected dive into the zeitgeist from around the dawn of the Thompsons’ recording career. One of the best things about watching old episodes of CHiPs on DVD is listening to Alan Silvestri’s disco-based scores. With its unusually long title sequences, Silvestri was tasked with composing proper song-length themes to run along sun-drenched establishing shots of kids, dames or Ponch ‘n’ Jon rollerskatin’, skydivin’, windsurfin’ or cruisin’. If You Need Someone is that kind of song. It’s also the kind of song Alan Palomo was making at the time of his 2009 debut as Neon Indian (Psychic Chasms), gloriously bent synthpop that sounded like theme music for an early ‘80s Saturday morning kids’ science program. If You Need Someone’s hopscotch skipping melody is among the friendliest puppies Bailey’s ever raised, featuring another obscenely facile transition into chorus, a glorious and obviously necessary (!) walking bassline, a Latin percussion break in case Bobby Orlando’s listening at the console with remix notes, and the breeziest Bailey lead vocal this side of Rock This Boat. The result’s so breezy you wonder whether he’s being disingenuous, because a lot of Fiction’s lyric themes deal with anxiety and uncertainty, although I think this one is simply a balm for wishful souls. I don’t think it’s my favourite song on the record (at least not today; the list changes daily), but it’s the one I wanted to write about the most. Science Fiction would have made a great follow-up to 1985’s Here’s To Future Days. Stylistically it hews closest to the post-Joe Leeway Twins period of Nothing In Common through the more sedate Queer tracks, fine work which lost a little lustre after Babble’s scorched-earth effect on the catalogue. Fiction thus avoids the big-tent MTV panorama of the Alex Sadkin-Nile Rodgers albums, which have rightfully ascended to iconography even as some of their accoutrements would seem like pastiche were they deployed today. 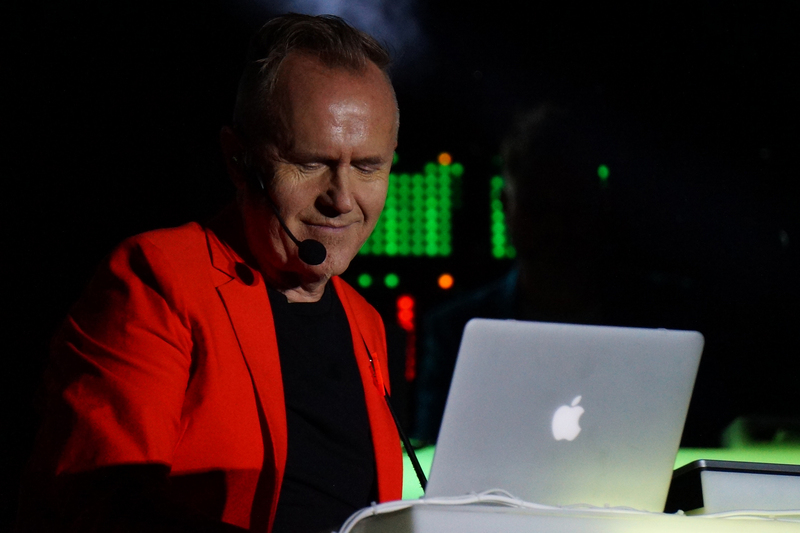 Given its laptop origins, Fiction’s tunes have been buffed up for concerts (tellingly, the first three Fiction songs to graduate to the 2018 setlist have Alice Offley on electric bass for dynamic heft), which begs the question of what Fiction might sound like with a modern-but-simpatico figure like Paul Epworth in the co-producer’s chair (I fantasized about Tony Visconti, briefly considered Mark Ronson, shuddered at Greg Kurstin). One might even wish for an occasional surge of sinister audacity, along the lines of 1991’s The Saint or 1993’s Drive, because that’s sort of where things trailed off 22 years ago. I think that’d be too much ground to cover for this particular survey. In the final analysis, he’s given us a great pop record. It’s anyone’s guess where Tom Bailey heads next, but remember this: the car is always revving in the drive. It was dead of winter when I learned Tom Bailey was defrosting his long-neglected Thompson Twins catalog for an American summer package tour, which, even accounting for a Brian Wilson-Beach Boys detente and a new Bowie record in the preceding 18 months, might rank as the biggest shock I’ve experienced in music. Curb whatever you’re thinking about package tours. To wit: logistical headaches indeed exist, but in this case, the execution in front of the velvet rope – which is all most of us see anyway – has been nearly seamless, the product immensely enjoyable. Everything I’m sharing’s refracted through the prism of bands playing shorter sets than they’d present as single- or double-bill acts. 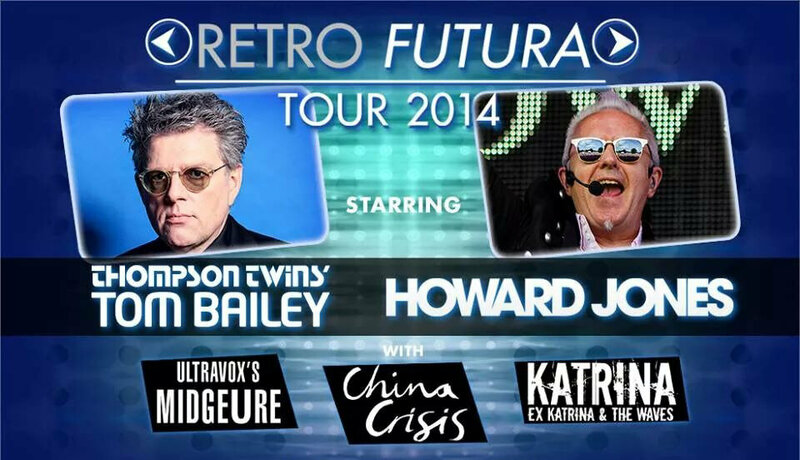 From the five acts on this 2014 Retro Futura bill – Bailey as de facto Thompson Twins, Howard Jones, Midge Ure as de facto Ultravox, China Crisis, and Katrina Leskanich sans The Waves, there’re precisely six people touring from the original lineups. So the Retro Futura business model won’t remind anyone of Aamer Haleem doggedly chugging through buildings and streets to spook retired pop stars into appearing on VH-1 Bands Reunited. Then again, VH-1 was peddling a T.V. gimmick. One could easily argue Retro Futura’s performing a valuable service. Pitchfork and its hipster ilk haven’t spilled ink on any of the Retro Futura acts, so the 1980’s new wave canon, as represented by these five, is one of unexplored joys for millennials approaching the music from a diet of Cut Copy, Wild Beasts, La Roux, Lights or Future Islands. And for those of us who were around during MTV’s UK-friendly salad days, the John Hughes movie in our heads has sprung back to life. 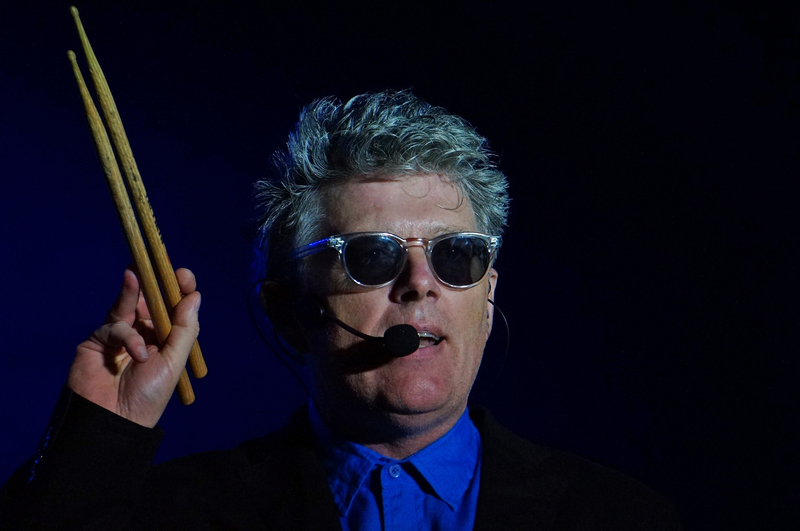 And for those who thought Thompson Twins walked on water, scratch that big itch: Tom Bailey is alive and well and wearing his Kate Bush headset microphone. He’s singing Twins songs for the first time in 27 years, which gives him something to talk with Vashti Bunyan about should they ever take afternoon tea. I’m nostalgic. I’m old enough to properly enjoy a good reverie and sharp enough to know reasons why. I recall the colour of the sky the first time I dug into a Thompson Twins album. It was a cornflower blue, just like the Into The Gap artwork. And I remember the sky when I got Jones’ Human’s Lib as a birthday gift: grey and pensive, which mightn’t’ve fit the thrilling suite on side one but fit side two’s “Don’t Always Look At The Rain” to a T. Bailey and HoJo are the top draws on this three-week jaunt, but Jones manfully ceded the anchor leg to his compadre, which, if all goes to plan, ought to impart a genuine air of celebration to each tour stop. For a time – 1984 (which really is the root year of this whole endeavour) – their acts represented the best of the second surge of new wave music: popular records which appealed to discerning collegiates and young urban professionals; artistically superior songs that 10-year-olds could buy from bestseller racks in mall stores. HoJo sang about self-actualization and positive reinforcement; Thompson Twins were a multi-racial boy-girl-boy trio who built pancultural music elements into their songs. Both acts featured singers comfortable in the high tenor range, which made for tremendously vivid choruses, and each could really write a hook. If one’s looking for a quick nostalgia fix from that root year 1984, these’re the guys you want. So. Wild horses and all that. I caught the first three shows (heart of Manhattan, sub-Philly and waaay out on Long Island) before coming home to type, and here’s what registered. Personality tics abound at this show. Katrina, distinct due to her gender, nationality and dearth of burbling synths, is also the sassiest performer, and it’s a canny play. The audience knows – and waits on – “Walking On Sunshine,” but the undercard’s a tough draw even for a seasoned performer, and she must pave the road with good material beforehand. Kat’s Waves had written and released the absolutely wonderful “Going Down To Liverpool” nearly two years before The Bangles lobbed it into the mainstream with that Leonard Nimoy video; here, Katrina and co. reclaim the song with a terrific reading, all “Ticket To Ride”-like drums and delicious guitar crunch. Debbi Peterson’s vocal on the Bangles single is winsome, but Leskanich outpoints her on pure power and tone. There’s a concession made to populism beginning with the Pennsylvania Kewsick Theatre show, where she incorporates the Bangles version’s falsetto tails in the verse, while Ado Coker adds the vaporous backing vocals to the chorus, but I’m fine with the decision. It might even be the best song I hear in the first three hours every night. Might be. There’s a lot of other good stuff to come. Otherwise, Leskanich shares a few vintage Waves songs (in the shows I’ve seen, the propulsive “Do You Want Crying?” only aired at Manhattan’s Best Buy Theatre) and rotating highlights from her new album, which she’s selling at the merch stand, and which she’ll autograph if you approach to tell her how great her voice sounds after years away from the touring grind. I’ve added that last clause myself because it’s true. And yes, “Walking On Sunshine” doesn’t disappoint. It’s the closest we get to a souped-up Motown stomp all night, a powerful dose of Americana in a night rife with Britishness. She’s quickly developed a good rapport with house guitarist Bones, too. China Crisis is not quite a 180-degree turn from Katrina, but we’ve clearly crossed an ocean. They wove F-bombs into two singles off what I consider the prettiest synthpop LP of the ‘80s, Working With Fire And Steel. That’s cheek. 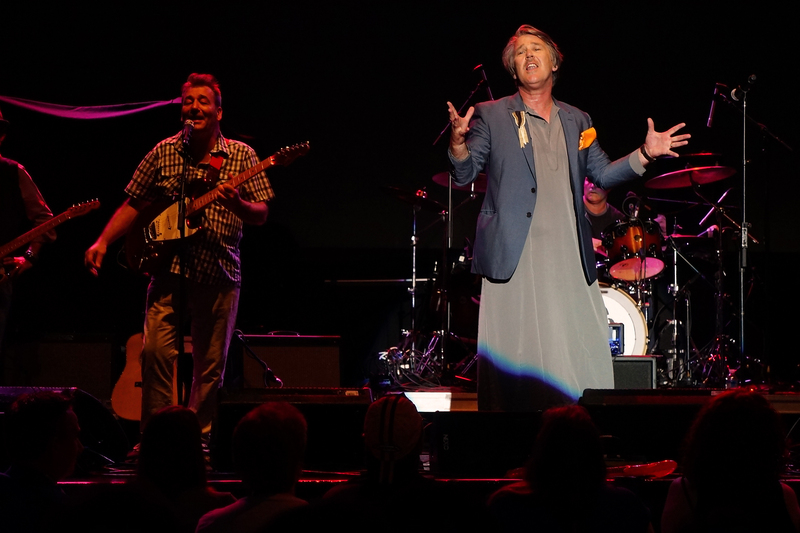 Singer Gary Daly works the room under that adage about dancing like nobody’s watching, which so far has included wearing a kaftan at most of the shows, occasionally flashing a bit of ankle. He wore a suit at the Pennysaver show and suddenly he could’ve been Ferry, Sylvian, Bowie. Spend a few minutes with him after a show or during his merch table appearances and you’ll learn the cheekiness extends well beyond his early song lyrics. CC don’t play anything off Fire And Steel here. It’s not by accident (yeah, I asked), and even wishful thinking won’t give Eddie Lundon his turn at the mic for their biggest UK hit, but the set doesn’t want for quality: an expansive “Arizona Sky,” a coolly insinuating “African And White,” and a hatful of highlights from 1985’s Flaunt The Imperfection. The four-song set-within-a-set clearly strikes a chord with the Crisis faithful at these shows, particularly at the Pennysaver, where there was a lot of front-row pogoing. Lundon is CC’s field general, and in these early shows his stage directions are the clearest indicator of the last-minute challenges brought upon the tour. It’s subtle: a gentle nod, a move into everyone’s line-of-sight behind Daly, a few off-mic whispers to guitarist Bones. (For these shows, Tracy Schnurr has been on drums for CC.) This band plays CC’s delicately flowing music with a curious mix of learning-curve focus and typical live-show rawness. When it works it’s exceedingly fine (“African And White” comes off great), when it’s a work-in-progress you simply have to concede the pressures of backstage machinations (“King In A Catholic Style” got better each night; it needed to, and hopefully it stays there). On this bill, CC’s the least-known entity to American ears, even to this relatively knowledgeable set of American ears, but they ought to win a few converts. Midge Ure will definitely win a few converts. Manhattan’s wise to him, but the Keswick and Pennysaver crowds reacted like they’d just discovered a great new ice cream flavour/religion/beer. Commitments were signed in blood during post-chorus respites. Smartphones lit up as people Soundhounded and Googled. Peals of delight rattled from the pews at every widescreen refrain. Ure’s six-song set somehow feels like a complete career overview, despite leaving another dozen terrific songs on the cutting-room floor. It’s like the modern resume, everything wrapped up in a single page, brimming with scannable keywords. Such as: hymn, God, fade, Vienna, tears. 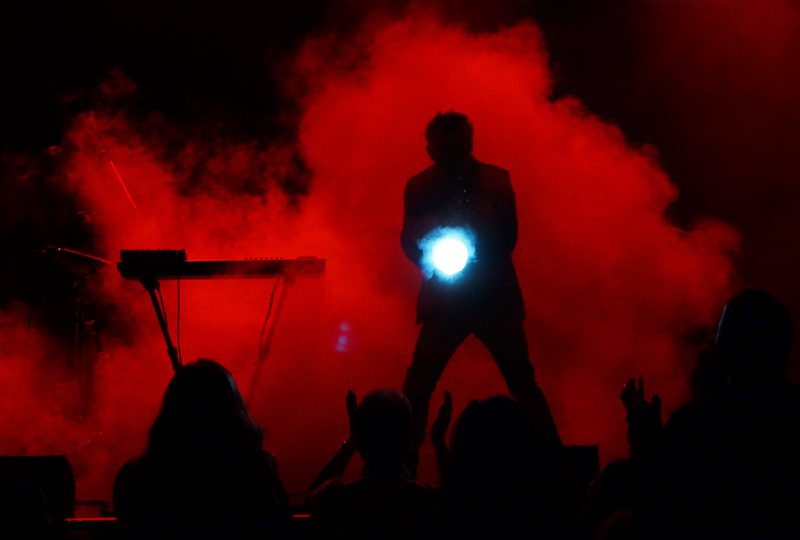 Drawing from three of his most significant ‘80s playbooks – the nearly always great Ultravox, his solo work, his stewardship of Steve Strange’s Visage – Ure’s set is the most intense, the hardest rocking, the fastest moving. It’s high drama from the moment Gary Daly tags him in: a swath of muso feedback, a suspenseful overture, a count-in, a lurch into “Hymn (The Power And The Glory)”’s muscled synth-rock. 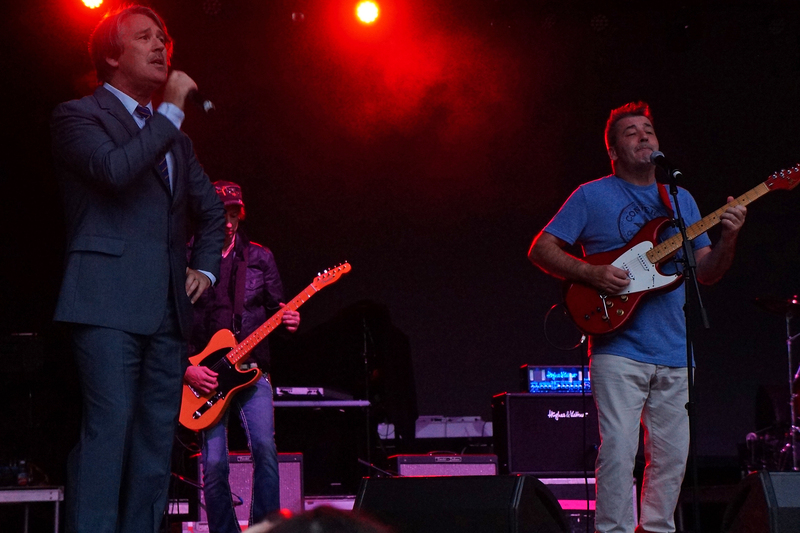 The audience is always delighted at the adrenaline rush, happening not two minutes after China Crisis’ amiable departure, and although Ure doesn’t maintain the intensity level all set – can’t, really, he is not The Ramones, maaan – he’s set a template that works time and again. House bassist Doug Wright’s clearly in heaven with this music. “Fade To Grey” is a known commodity, but it catches crowds off-guard because not everyone reads label credits. Despite dialling down the synth, it’s a fine reading of a seminal tune. “If I Was” retains its arch grandeur, but for sheer pomp there’s no matching the epic “Vienna.” It’s the easiest photo opportunity any of you would-be photogs’ll get all night, the moments wherein Ure steels himself for that soaring, wall-rattling crescendo. “Dancing With Tears In My Eyes” is here, too. It’s torridly romantic in the way “Both Ends Burning” was torridly romantic. Love under fire. Enjoy that one, as his high tenor, hardly touched by decades of work, ruffles the hair cells in your Corti. Midge, you wrote some monster choruses, man. Predictably, Howard Jones presents the fewest surprises in these shows, and I’m not saying this to be oxymoronic. Everyone knows HoJo’s been optimized for peak efficiency since forever, so the variables come down to set design and song choice. Like everyone else on this tour, HoJo remains in fine fettle, so the choruses retain their uplifting vim in identical or close-neighbouring keys to the records of yore. Because his 45s were groomed for maximum hummability, concert HoJo sounds awfully beefy in person. For various reasons, there’s not a lot of crowd singing in the earlier band sets, but the audience is right there with Howard soon as he hits the bridge. It’s not surprising on early staples, but to hear the crowd double his decibels on a later single like “Everlasting Love” is a sharp reminder of how little modern chart pop is singable. That “…friend and a lover divine/wait for it, wait for it, give it some time” refrain might look stiff on paper, but it’s excitably elastic in surround sound. And it’s not even his best tune. That honour probably rests somewhere within the closing quarter-hour salvo that is “Things Can Only Get Better,” “What Is Love?” and “New Song.” Good things come in threes, though, so I hope he’s not making a habit of dropping “What Is Love?,” a fate which befell the Keswick show. Like any good technocrat, he’s put his back into modernizing the sound on these songs. For the most part, the transition’s been smooth, although the techno “Things” reprise is too much of a meh thing. It only leaves enough room for one ballad, and no one’s surprised that “No One Is To Blame” gets the nod over “Hide And Seek.” Presented in its hit arrangement but mercifully shorn of Phil Collins, the tune’s aching grace breathes anew. Turns out Howard’s quite the prattler onstage, too. We get a fair bit of pre-song testifyin’. 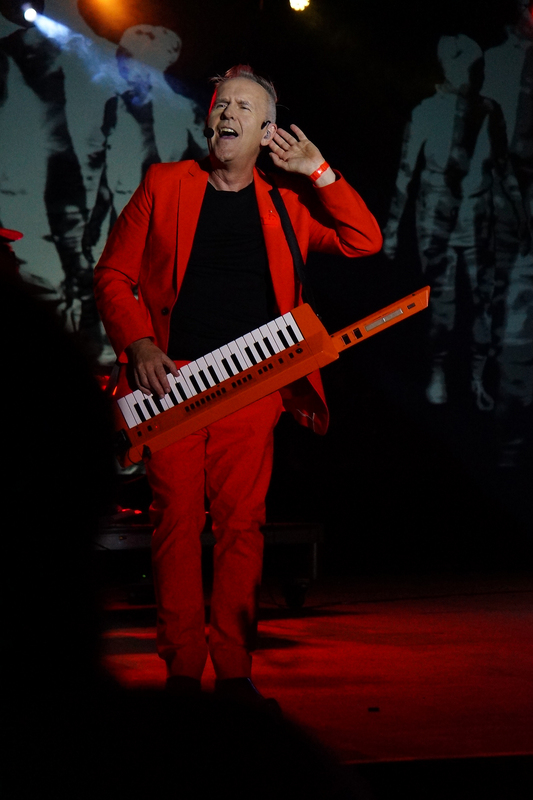 We also get – and this is important, so please take note – the auteur in a blindingly bright orange suit and matching keytar. Electronic kit’s played by Jonathan Atkinson; Robbie Bronnimann’s synth second-in-command. 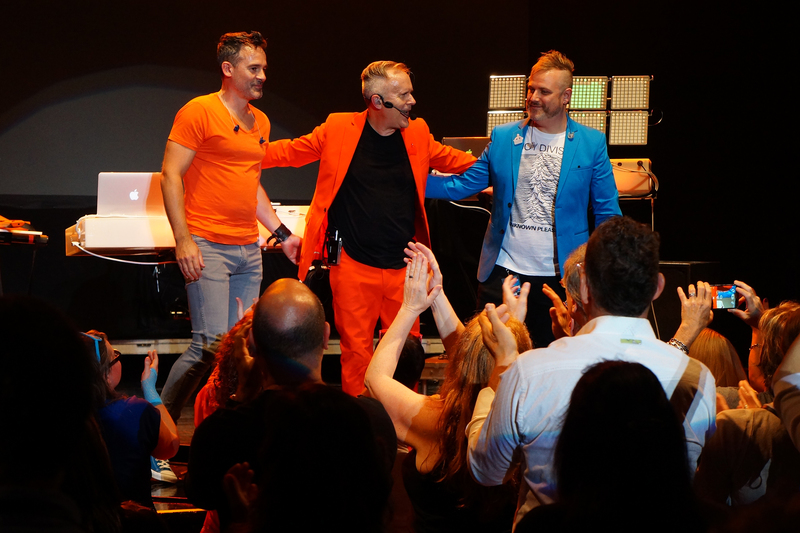 Robbie won’t wear orange, despite HoJo’s pre-tour sartorial entreaties to the online community. Maybe Robbie don’t surf? And then there was one. Bailey. You never forget your first time, unless it happens twice, and 29 years apart at that. I’d only seen Thompson Twins once before, back when I was so young and full of brio, ridiculous things like playing a Twins tape for 858 consecutive days seemed both feasible and logical (Tom, if you’re reading, the last 394 days of that stretch were dedicated to Close To The Bone; make of that what you will [insert smiley face emoticon]). The passage of time tends to wipe slates and dreams clean, so while much of 2014’s been devoted to living in the present, I’d kept an eager eye on August 21st since the date was announced. I know I’m not alone in this. You never forget your second first time. I think Bailey understands this. The Thompson legacy’s been imperilled for the better part of two decades, left untended by its contributing members and whatever remained of management and A&R, subject to varying degrees of dismissiveness and sporadic derision from the tastemakers. All this, despite the fact prime Twins was chock-a-block with wonderfully simpatico production from sundry skilled hands, stoked by some of the best arrangement layering I’ve heard since the days of ABBA, fired by instantly memorable chorus and refrain peaks, signposted with incisive and insightful lyrics, all of it ably and colourfully sung by the Neapolitan Mod Squad (or whatever the hell Rolling Stone called them) in endless balance variants. Or, if you want an assessment in 10 words: superior craftsmanship from the last period of great popular music. 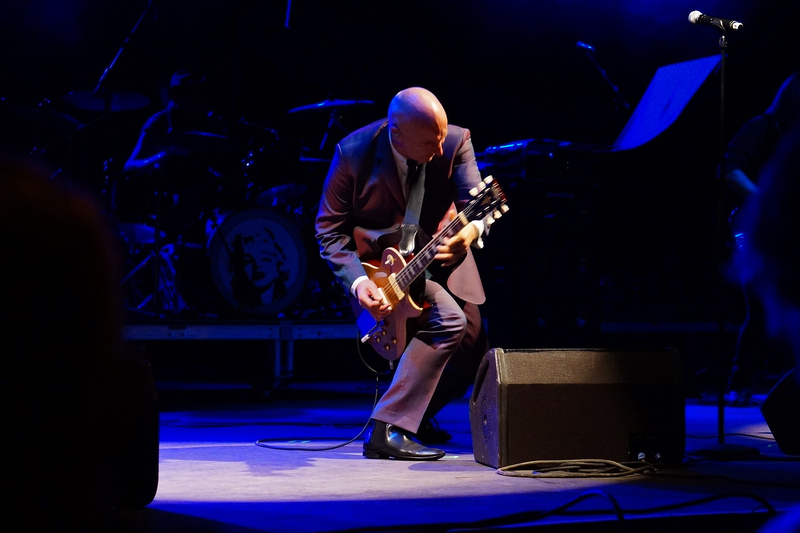 That’s the backstory for boatloads of people attending these shows, and from the moment David Stopps introduces Tom to the strains of an alluringly re-recorded “We Are Detective,” drama’s as high as…as a Midge Ure chorus, for crissakes. Lights low, nothing trained downstage, dry ice like pea soup, the floor shaking to the churning “In The Name Of Love” intro, a tousle-haired figure purposefully moving through the murk. Next, a spotlight beamed into the audience, that nervy opening verse (“hey you…I’ve seen your face before…”) punching through the mix, swamped in echo, sung as stonily as it was on record 33 cold winters ago and sounding very nearly the same. The chorus arrives. The downstage light nails its mark. And then he’s among us again. 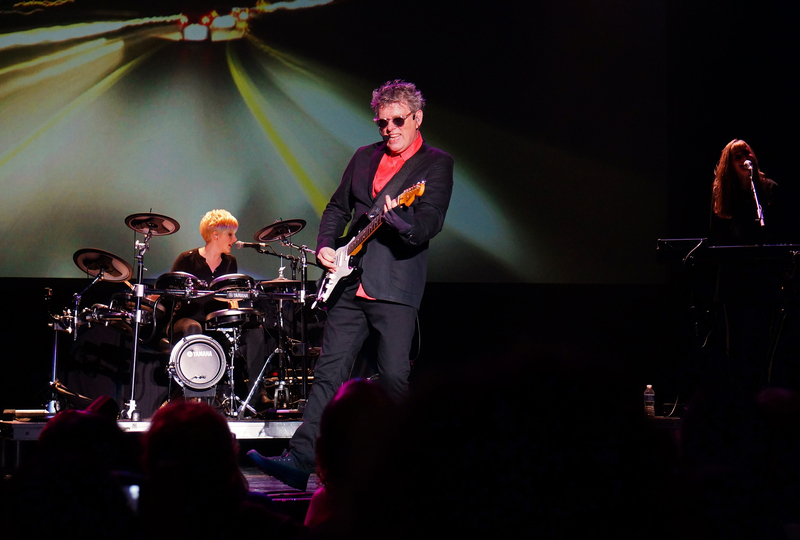 Tom Bailey’s among us again, and it’s 1983 or 1984 or 1985 or 1987 again, whenever you were old enough for your parents to let you out for concerts, or whenever you finally cottoned onto Twins songs. The journey’s complete, mission accomplished, cherries ‘n’ champagne corks a-popping . And man, you should see how the room sways for this guy and his imperilled legacy. The singalongs. The choruses are part of the crowd’s collective DNA. They’ve got the answer vocals to “You Take Me Up” down pat. They’re singing keyboard refrains in the breaks. I saw Keswick with several people I know from the online community, including one family who’d driven up from Florida. They linked arms during “Hold Me Now.” Wouldn’t you? Tom and band present nine songs in 55 minutes. To my delight, and I hope to yours as well, he often teases the arrangements out to supersized lengths, just as he did in the Twins’ touring years. Call them 10-inch versions; they’re not quite as long as the old extended club mixes, but each spotlights important elements of the songs that usually get buried beneath vocals on the singles. Thoughtful arrangements, cleverly presented. Tom himself plays everything he packed for the bus: Novation synth, Fender electric, harmonica, mounted toms, tambourine. He’s like a kid in a candy store, restless, curious, a bundle of energy. As support, he’s brought in three players of pedigree: synthesist Amanda Kramer’s been in both Information Society and Golden Palominos; synthesist Angie Pollock’s been in Ian Broudie’s Lightning Seeds, and I saw her touring with Goldfrapp in 2008; electronic kit drummer Emily Dolan Davies was all over Bryan Ferry’s last record, which is as close as a sessioneer gets to a drop-the-mic argument. There’s a lot of work for Pollock and Kramer, handling basics and several leads, leaving just enough room for Bailey to drop in a few solos and intros. Dolan Davies cuts an arresting image, playing with a metronomic fluidity that had me thinking back to Boris Williams’ pre-Cure days as a touring Thompson. All three sing, which is crucial to the Thompson blueprint: Joe Leeway’s and Alannah Currie’s vocals are laced through most important Twins tracks and these renditions would be bereft without high harmonies or answer vocals. I imagine Tom made an executive decision to stay away from songs with significant solos (“We Are Detective,” “Watching”), but this unit, impishly referred to onstage as the “sisters of mercy” is well suited to the task. Pollock reprises the old “Sister Of Mercy” answer vocal with haunting accuracy. Two songs stand out: “If You Were Here” has been doubled in both verse and duration, and both amendments are inspired winners. The 1983 original, an album track lofted into iconography by association with a triumphal scene in John Hughes’ Sixteen Candles, was a gorgeous record of vapour trail synth lines, an unremitting new wave beat and a whispered lead vocal of heroic longing. This new “If You Were Here” toys with perfection but skirts the pitfall by stripping it of its insularity, building to a (what the hell, why not?) Ure-like intensity by packing a ghostly coo from the Pollock-Kramer-Dolan Davies team into the middle and a staggeringly bold peak into its new verses, replete with yeah-yeah-yeahs and Bailey at full throttle. It might be the second-best song of his career, now. But “Hold Me Now” is forever The One. Played out at nearly eight minutes, it’s given all the time it needs to establish, lead and, eventually, hand reins to the audience. From the opening piano figure to the naked opening verse, from the first chorus to the rippling instrumental break, from the final verse resolution to the sunburst finale, the basic version you’ll hear on this tour is as spectacular as you’d dare hope. But in some cases, magic blooms. I’m reminded of something Ferry said once about live performances: “Say there are 12 high points in a piece; it’s usually impossible to bring them all out in a studio, you get maybe half of them. In a live performance, though, it’s often possible to bring them all up.” At the Keswick on Friday night, Bailey bullseyed. Ceding control to a raucous throng of leatherlungs, Tom Bailey finally cut the music and brought his sisters of mercy downstage to lead an a cappella round of “Hold Me Now.” The music had ended, but so had the long silence. 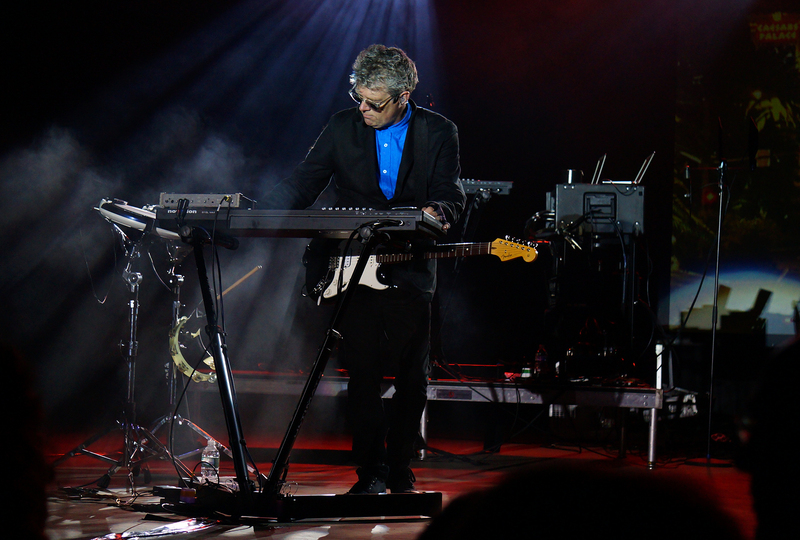 Tom Bailey, bracketed by his band, bowed deeply and left the stage.